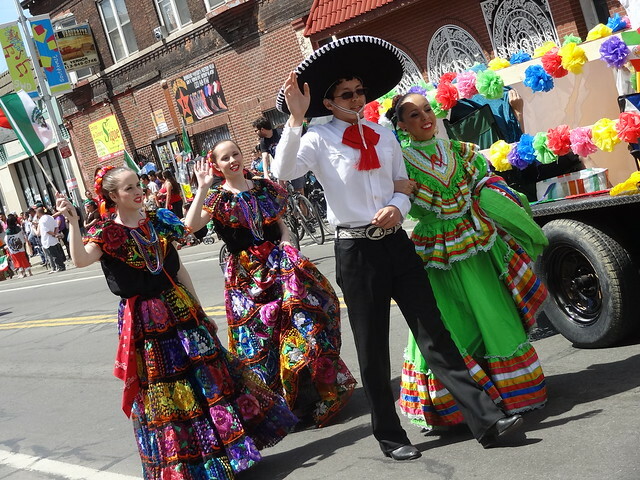 It is a gorgeous Sunday afternoon in Southwest Detroit as throngs of people line Vernor Hwy in anticipation of the Cinco de mayo parade. 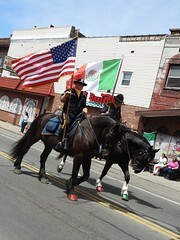 Cinco de mayo is a celebration of the victory of the Battle of Puebla and is celebrated annually in the Mexican-American communities in the US. People are stacked four and five deep along the route, as we near Most Holy Redeemer we see a break in the crowd and take our place among them. 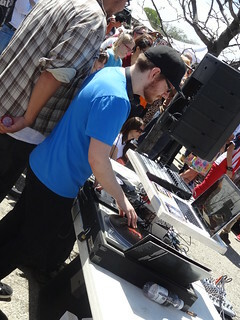 The mood is distinctly festive, the street a sea of green, white and red, Mexican flags in a variety of sizes are being waved high in the air. Alongside Luna’s Bakery a stand is selling glasses of cold juice; mango, pineapple, honeydew and pomegranate. We duck inside for a cookie, purchase our juice and are back on the other side of the street before the parade begins. Pedestrians continue to crowd the sidewalks as the activity begins. 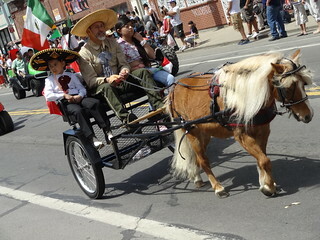 Music fills the air as the sun shines brightly overhead; folks in traditional Mexican dress stride down the street, vaqueros wearing sombreros and embroidered shirts ride high upon perfectly groomed horses. 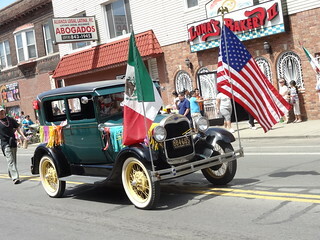 Banners bearing names of local restaurants are draped across the front of antique cars and semi trucks, a huge black semi carries a multi-piece band on its bed. Representatives of Wayne State University, community groups and mounted police join in the fun. Senorita’s in colorful dresses toss strands of beads into the crowd, others toss handfuls of candy to the smallest spectators; the line of participants stretches long into the horizon. 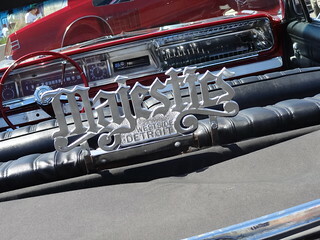 As the parade finally winds up we head over to see the Blessing of the Low Riders near the Michigan Welcome Center. 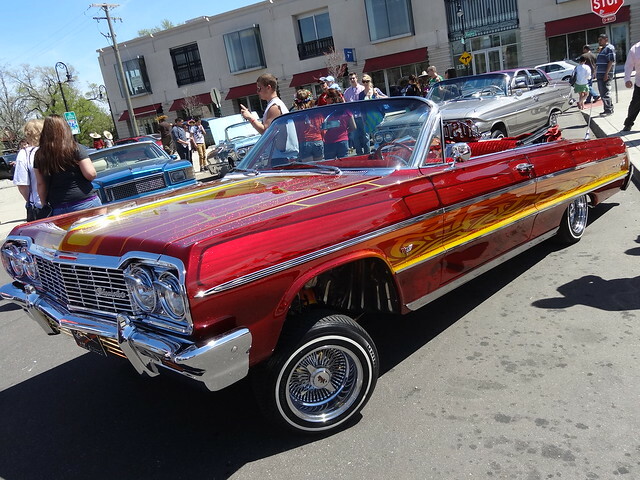 Cool custom low riders are parked irregularly up and down the street, swarms of people make the lanes nearly impassable. 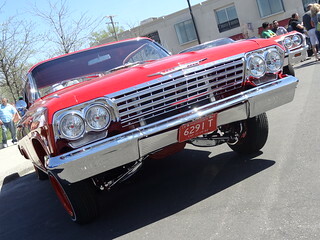 A Cadillac Brougham in silver and magenta wears intricate pinstripe patterns, a red Buick Regal resting on the driver’s side tires gives us insight into what kind of stunts the hydraulics are capable of. 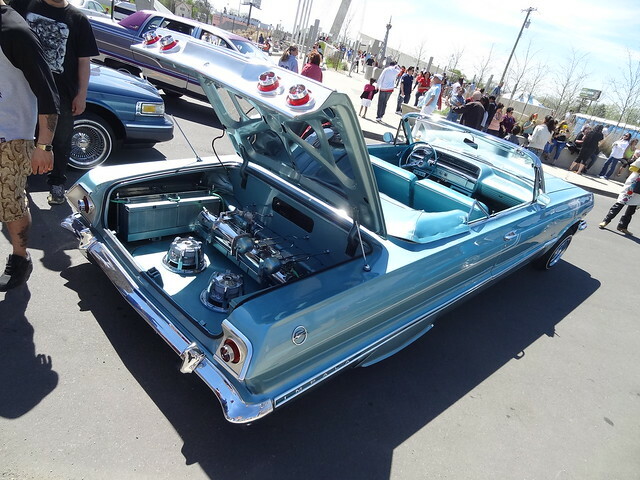 1960’s Chevy Impalas seem to be the vehicle of choice here, many are convertibles, decked out in amazing paint jobs, they are simply works of art. Chunky red metalflake adorns one vehicle, designs in orange and yellow jump out at you, the red velvet interior is ultra sweet. 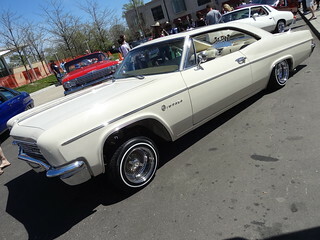 There are lowered Monte Carlos and more unusual, a vintage car from the 40’s in white with a brown painted roof. At first a blue Buick Regal looks rather plain, that is until you notice the amazing abstract design in turquoise, silver and lavender that adorns the roof! Pinstriping is found everywhere; colors, width and style vary from vehicle to vehicle, the scene is eye candy for professional and amateur photographers alike. 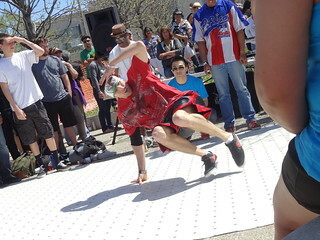 We spend a little more time at the celebration, off to the left a DJ plays tunes as a group of break dancers take turns showing off their best moves. 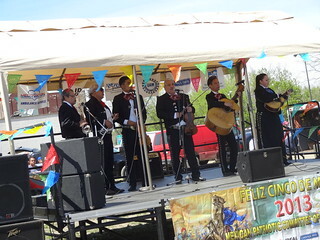 A Mariachi band assembles on a nearby stage an begins to play traditional Mexican songs. White tents cover tables selling souvenirs, T-shirts and food. Speaking of food, it’s time for lunch! When looking for fried chicken in Detroit, the southwest district is probably not the first area that comes to mind, it will now. 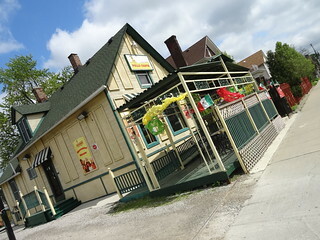 Over on Junction just north of Vernor is Pollo Chapin; a little yellow house trimmed in green, serving up some of the best fried chicken in the D along with Guatemalan specialties. Inside you will find a small dining room and a counter for placing carry-out orders; a large brightly colored menu is mounted on the wall. We are eating in, we seat ourselves at a small round table and begin the process of deciding what to eat. 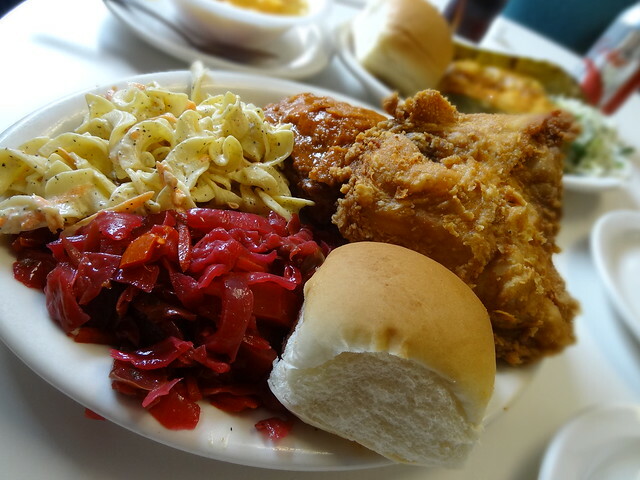 Chicken comes in regular and spicy versions, combos vary by the number of pieces and sides. We order a three-piece; two regular fried, one spicy, our sides are curtido and egg noodle salad. On our waitresses suggestion we add a chicken tamale and a side of slaw. First to arrive is a bowl of house made chicken noodle soup, it’s delicious. On the table a large glass jar is filled with homemade pickled vegetables. Only halfway through the soup the rest of our food arrives, plates are piled high with scrumptious fried chicken and colorful salads. While Kris digs into the chicken I unwrap our Guatemalan tamale (tamal), wrapped in a banana leaf the masa is made with broth and lard producing a moist, rich and fluffy outside to a tasty filling of chicken, vegetables and spices, yum! The slaw is a combination of cabbage and cilantro, there’s some heat to it too, very tasty. The chicken is cooked perfectly, juices flow as we peel off chunks, the spicy sauce is flavorful without being overpowering. The egg noodle salad is excellent, lots of black pepper, the curtido a blend of cabbage and beets has a nice taste. We rest our forks and sit back in our chairs as our server reappears with a complimentary plate of sopapillas for dessert. Portions are generous and the food is excellent. On our way out of southwest we make one last stop at Chilango’s Bakery on W. Vernor; a tip from our friend The Detroit Foodie. 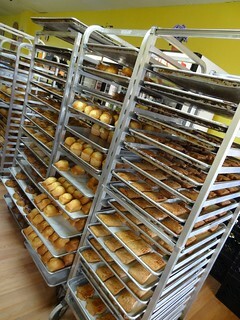 Before we enter we are greeted by the aroma of fresh-baked goods filling the air, we open the door to find rack after rack of fresh from the oven items cooling on metal trays. On the left, glass cases are filled with everything from cookies to sweet breads. 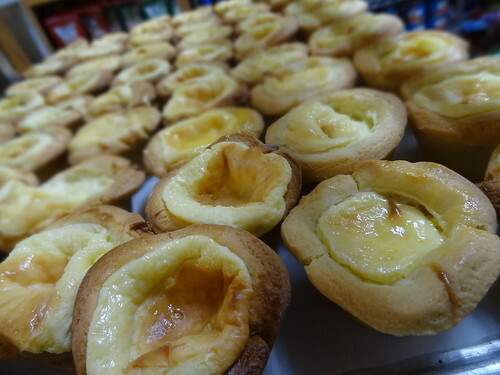 The bakery is self-serve, simply grab a tray and a pair of tongs and help yourself. Spanish is the primary language spoken here, but staff members are happy to answer questions as best they can. The empanadas with fruit filling are one of my favorites, bright pink cookies are dusted with a layer of powdered sugar, cream cheese and cherry filling spill out from pastries on the cooling rack, it all looks wonderful. We fill a tray with an assortment of goodies, the cashier packs them carefully in a white paper bag. Back in the car I am already thinking about which one I will have for breakfast. Love the photos & great posting…Glad to hear you enjoyed the food at Pollo Chapin (it’s one of my favorites) & Chilango’s! On your next visit to SW Detroit put at the top of your list (if you have not already been): Neveria La Michoacana. It’s an ice cream shop open only spring thru late summer, and it sits directly across from Clark park on the NE corner of Vernor & Clark. My suggestion, order their melon or horchata agua fresca -and- pick up a few paletas (aka fresh fruit popsicles) they’re all made in-house and they’re fantastic!